Bryan, TX (May 10, 2016) – CHI St. Joseph Health Regional Hospital’s Emergency & Trauma Center officially opened on Tuesday, May 10, 2016. With the only Level II Trauma Center in the Brazos Valley, CHI St. Joseph Health has always been the region’s leader in delivering the highest-level emergency and trauma care. With the new Emergency & Trauma Center, CHI St. Joseph Health’s physicians, trauma surgeons and highly experienced emergency and trauma team are more equipped than ever to provide a better patient experience and the expert care that can make the critical di­fference in an emergency. We’ve doubled the size of our facility – to over 24,000 square feet – to provide spacious common areas and private treatment rooms that are more comfortable and large enough for loved ones to stay by your side. 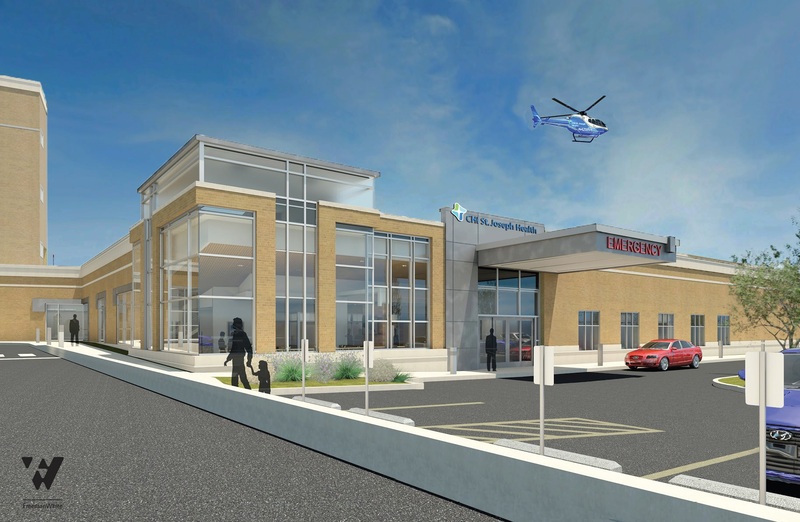 Additionally the new facility offers shorter wait times and with the addition of rapid exam rooms to treat minor emergencies, non-life threatening illnesses and simple injuries efficiently. The space is also intended to be particularly nurturing to seniors, decorated in cool, cheerful colors and flooded with light to help enhance visibility and reduce falls. Whether it’s a minor emergency or major trauma, we are now better equipped to care for the 55,000 patients seen annually and to serve the future growth of this community. “This is an exciting time for our community. What started out as a vision 80 years ago by the Sisters of St. Francis, has now evolved into one of the most influential health systems within the 9-county region of Brazos Valley. Not only are we serving patients within Bryan/College Station with the highest level of emergency care, but our reach extends into the rural communities surrounding us. Our commitment to the residents of Brazos Valley is to be the trusted source for healthcare,” says Rick Napper, President and CEO, CHI St. Joseph Health. The trauma program at CHI St. Joseph Health Regional Hospital is a verified Level II Trauma Center by the American College of Surgeons, and a designated Level II Trauma Center by the Texas Department of State Health Services. CHI St. Joseph Health’s emergency and trauma team consists of trauma surgeons, specialized physicians, nurses, EMS first responders, and the only AirMed crew in an 80-mile radius. The Regional Hospital has also been a Certified Primary Stroke Center since 2007 and is an accredited Chest Pain Center with PCI and Resuscitation. Established in 1936, CHI St. Joseph Health is a faith-based, not-for-profit health system committed to excellence and compassion in caring for the mind, body and spirit while creating healthier communities. CHI St. Joseph Health is comprised of five hospital facilities across the Brazos Valley, including Regional Hospital, the region’s highest level trauma center. CHI St. Joseph Medical Group operates more than a dozen primary and specialty care clinics around the region, offering expert care, closer to home. CHI St. Joseph Health is a part of Catholic Health Initiatives (CHI), one of the nation’s largest health systems. For more information, visit ER.CHIStjosephHealth.org. Headquartered in Englewood, Colorado, CHI operates in 19 states and comprises more than 100 hospitals, including four academic medical centers and teaching hospitals; 24 critical-access facilities; community health services organizations; accredited nursing colleges; home health agencies; and other services that span the inpatient and outpatient continuum of care.